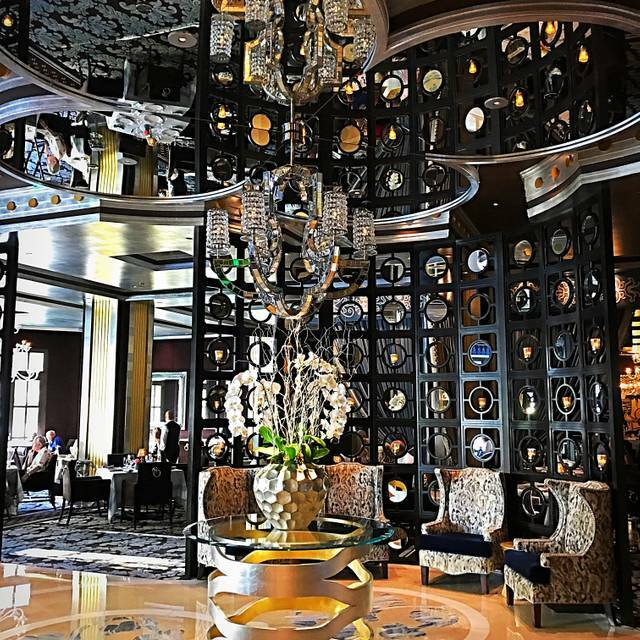 Savor every rich detail. Award-winning, four-star celebrity chef and restaurateur, Jean-Georges Vongerichten invites you to realize steakhouse dining at its finest with prime steak, seafood and lamb accompanied by fabulous sauces, sides and meticulously selected wines. Ensconce yourself in the establishment's handsome chocolate brown and delicate Tiffany blue décor – the elaborate design of Michael DeSantis. To further enhance your experience, prominent pieces of artwork are on display including three commissioned paintings by Carlo Maria Mariani, George Deem and Michael Gregory, as well as a water-themed canvas screen created by Joseph Raffael. Dinner & service both amazing. Went 2 nights!!! Hats of to Jesse & Howard. Great, great, great. We arrived a few minutes before our reservation, went to the bar by the time our drinks were ready our table on the patio fountain side was ready. Food was great service was perfect. Perfect for date night or anniversary.. Seated outside it was a great view of the fountains. The waiter seemed uninterested and rushed us through ordering drinks, appetizers and entrees. He came by twice in the first minute for drink orders. Then immediately ask for our food order. I ordered 18oz bone in ribeye medium. When served, the steak was overcooked medium well to well, but because the waiter was no where to be found. I chose to eat it rather than wait for another to be cooked. That was my choice. 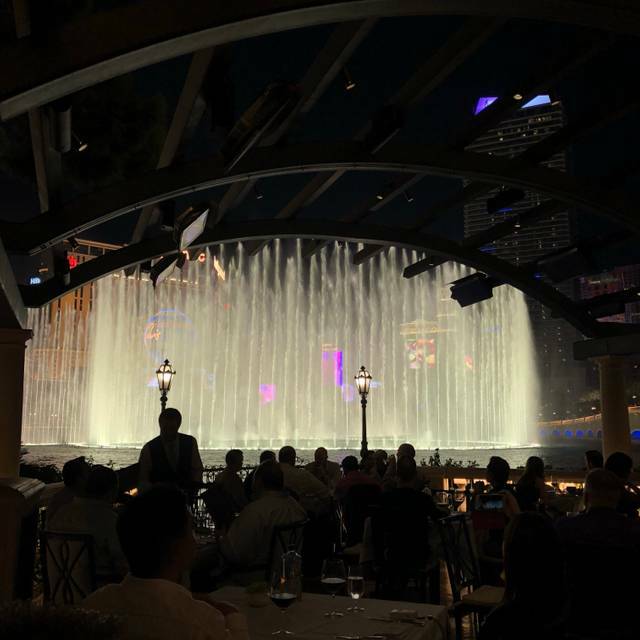 Great food, excellent service and spectacular fountain show! The restaurant location and service was excellent. The food was good, but my ribeye quality was not as good as I have had elsewhere for a little less money. The flavors were good just a little too fatty. 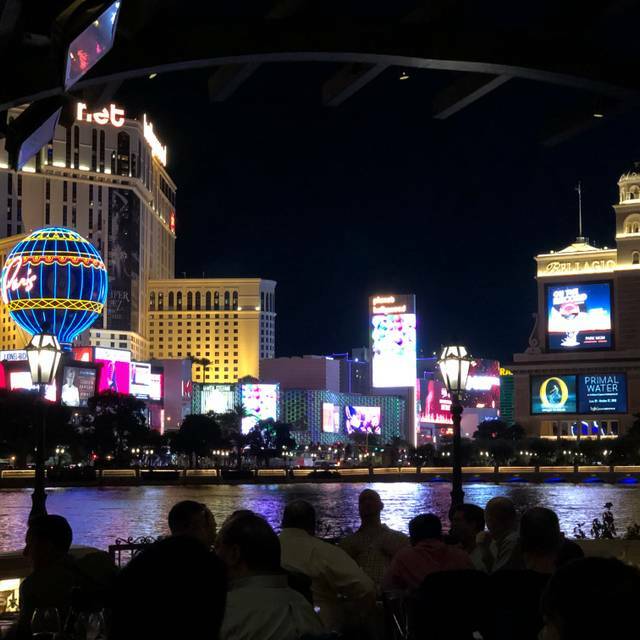 This is a typical Vegas fine dining restaurant with a wonderful wine list. 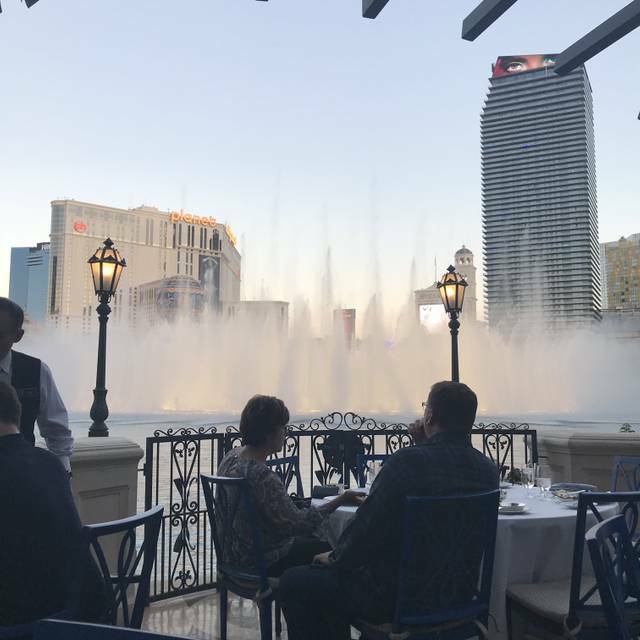 They have an outdoor patio the overlooks on to the Bellagio Water Fountain show, however this time is was closed due to a private party so we dined inside. Nice quiet place to sit and enjoy a great meal. Always a pleasure dining at Prime! The service, food and atmosphere are top notch. The patio was wonderful overlooking the fountains. Our server Paul was outstanding. The onion soup was superb, but the Caesar salad was way over dressed. The rack of lamb, in my opinion, was inedible. It was over-seasoned and dry. I have never had a spicy rack of lamb, which would have been okay if the menu said it was spicy. It also had no hint of mint but the plate had numerous (too many) cucumbers and and only three olives. The strip steak was average at best. The baked potato was good but it is hard to mess that up. The broccoli was drenched in cheddar sauce. I would not go back unless it was for drinks and soup on the patio. We went here for my best friend’s birthday and it could of not been anymore perfect. First and foremost we ran late (I called to let them know) and they still accommodated us, very professionally. On top of that the service was impeccable and the food was to die for. We cannot stop raving about how delicious all our meals were. The French onion soup is a must, you can cut the steak with a butter knife and the scallops were literally cooked to perfection. The ambiance was perfect and it started off our night before watching O magically. Thank you, we will be back!! 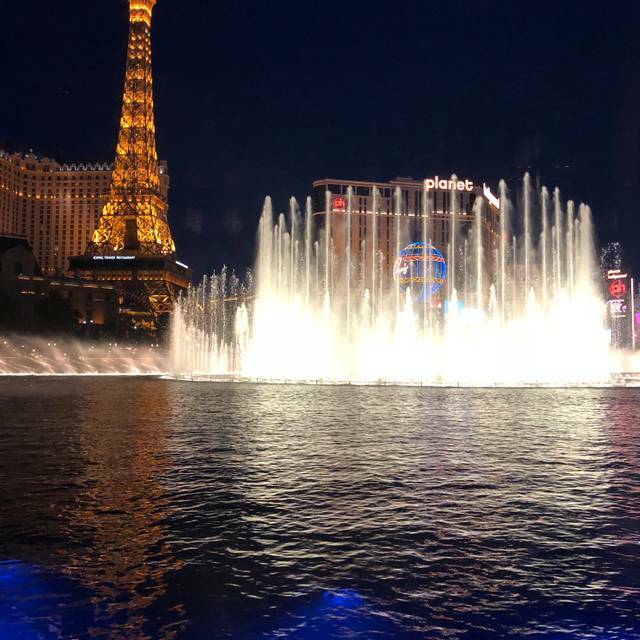 Sitting on the patio watching the Bellagio fountains has got to be one of the classic ways to celebrate a special occasion. Excellent service and great food. Pricey and worth it. Excellent for a special occasion. Beautiful interior decor and view for the dancing water show. Wow... the best Sauce Béarnaise I’ve ever enjoyed! Foie gras, aged bone in Ribeye w ginger sweet potatoes & citrus glazed carrots.... perfect dinner! Michelin Star Chef Jean-Georges Vongerichten puts his stamp on a fantastic restaurant. 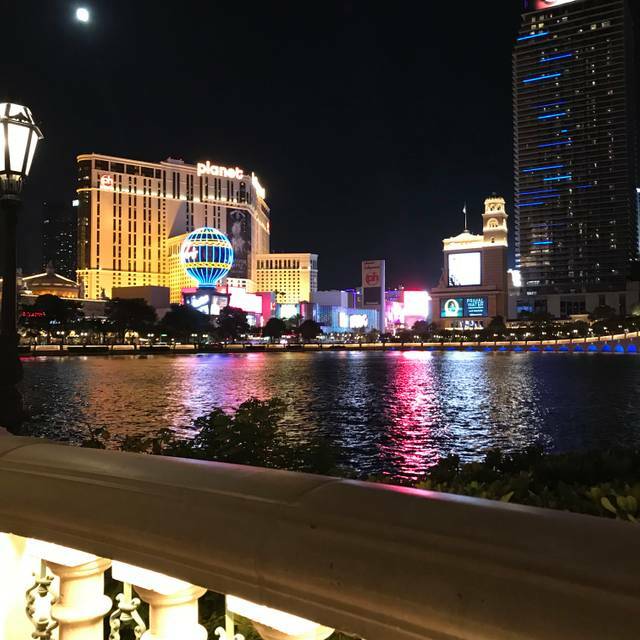 You can’t beat the location right in front of the Bellagio fountains. Excellent service, great atmosphere, foodie excellence... what more do you want?!? We scheduled a reservation for the patio a week or so ago. When we arrived we were told it would be 15-20 minutes, so we sat down at the bar for a drink. A gentlemen came over about 25 minutes later and said we are ready to be seated, he started walking into the dining room, I stopped him and explained we were waiting on the patio seating. He left and promptly returned to tell me it would be 1.5 to 2 hour wait....obviously we chose to leave and eat dinner at another location in another hotel. Since this was a business dinner and I had my team with me, it was pretty clear they would also not be scheduling to visit the location any time soon. Great location for a business dinner yet romantic for date night. Loved everything about this restaurant. Highly recommended. This restaurant is simply the best in both food and service. 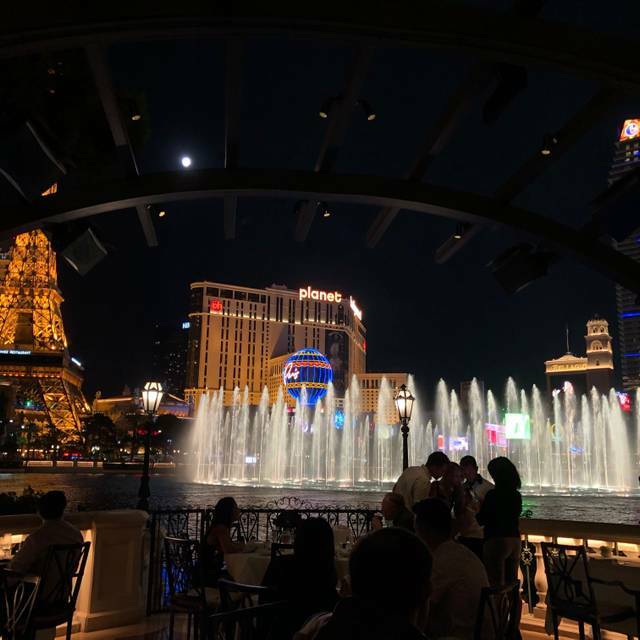 Request to sit outside and enjoy the Bellagio Fountains. Excellent dessert menu! Patio dining was the best thing we could have done! It was beautiful and service was amazing! The food is really good. It's a little pricey but the whole experience was worth it. We arrived early to our reservation, sat at the bar and had a drink while our table was ready. Bar tender was real short with us but very friendly with the next couple that sat down. Must be something in my face but that made us feel unwelcome. Our server on the other hand was excellent! Very polite and professional. Quite knowledgeable about the menu and went above and beyond to make sure we had a good experience. My wife was feeling sick and he brought over some tonic water to help her feel better, we never asked for that, he’s just a good person that way. Kept checking on us and asking if she needed anything. Our server made our visit worth our time. LAS CHICAS DE LA ENTRADA DE RECEPCION TIENEN MUY MALA CARA Y SON LAS QUE TE RECIBEN PARECIERA QUE NO QUIEREN QUE ENTRES TE ATIENDEN MAL Y DE MALA CARA NO TIENEN CORTESIA NI QUIEREN ATENDER AUNQUE YO TENIA RESERVACION TE HACEN ESPERAR DEMASIADO Y CON MALAS CARAS TE EXPLICAN TODO, LOS MESEROS CORTANTES Y NADA ATENTOS LO UNICO EXCELENTE ES LA COMIDA Y EL AMBIENTE DE VER LAS FUENTES DEL BELLAGIO UN LUGAR TAN CARO PARA PESIMO SERVICIO. We were able to make reservations easily. When we arrived, we had a choice of eating inside or outside. They gave us a great table with an amazing view of the fountains. Staff, food, drinks, dessert, ambiance were all beyond our expectations. Be prepared to spend a great deal of money. It is very upscale! I asked for a patio table and thought I would never get It but i dis! Staff was extremely helpfull, Nice and Kind. They even putted us on a better table With a better view on the Fountains. Food was amazing and champagne price very affordable. Thanks you so much for this amazing moment ! 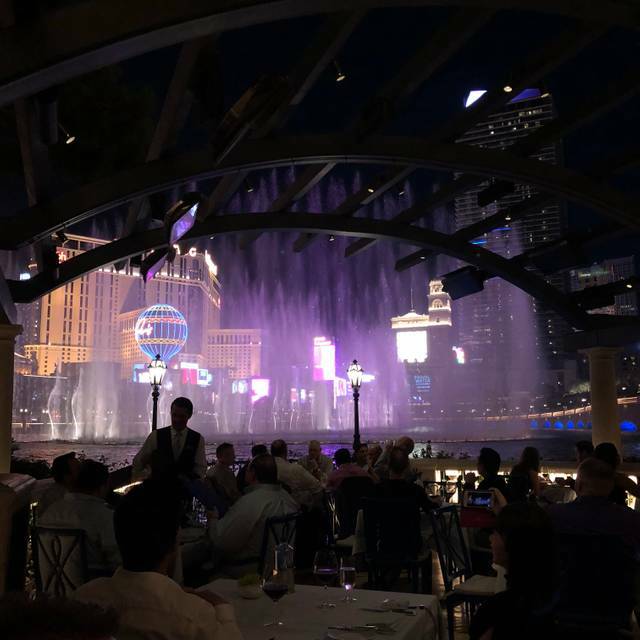 We dined at Prime for my sister in-laws birthday and everything was excellent starting with our excellent hosting seating us quickly and at an excellent table near the windows to the Bellagio fountain. All of our drinks were perfectly blended and served promptly. We ordered a seafood tower for 2 and the bacon wrapped shrimp that all were excellently prepared and served. Salads were right on and the PorterHouse for 2 was excellent - cooked to perfection (rare - medium/rare). Total bill was $400 per couple including the tip but it’s a steakhouse would you expect to spend less in Las Vegas. Superb setting for dinner. Attentative staff and been able to see the fountains was spectacular. We had a table at the front so we were sat directly by the lake. The staff were superb but we felt the table next to us had a service that was almost a constant waiter talking to them and offering them drinks. Even the manager came and spoke to them to see how their meal was. Food was tasty, drinks were good. Free bread was pretty average, felt like the bread was heated up in one of those Subway ovens. We got steak and lobster and they brought every kind of sauce to go with it, this was superb. Sides were delicious but why must cheese be with everything? Service was awful! We asked the server if she could send over the sommelier and she refused stating she was well versed in wine and began to compare Bordeaux to Zinfandel. Not even close!!! Food was just okay and not well described. We are generally an easy group to please, but this was unacceptable when you are easily dropping $750 to $1000 for four people. Great on every aspect. The ultimate dining experience. 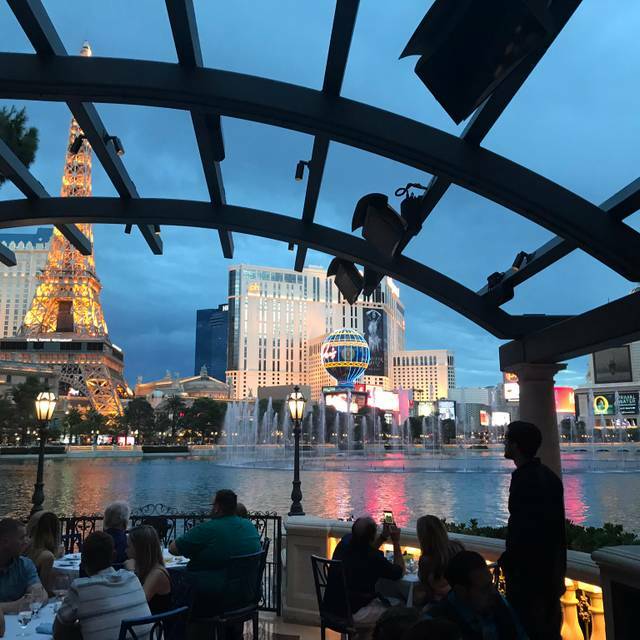 Magical setting on the patio, food was wonderful and, expectantly, $$ for Vegas, but the service was glacial. No one to take a drink order for 15 minutes. 15 more minutes for the wine by the glass order to arrive? Didn't get to order another glass of wine during with entree because no one checked on us and then it became obvious, if ordered, it would not arrive until after we finished our meal. Finished eating and plates stayed on the table for another 15 minutes. Decided against dessert because it would have taken too long. Had to ask a busboy at the next table to clear our plates and bring the bill. And this wasn't the restaurant being respectful of date night; I was there with my son for the BB tourney. We weren't in a race to eat, but 1 hour 45 mins for two guys to eat a steak dinner is way too long, despite the view and the company. Prime at the Bellagio was amazing, we got an early reservation (5:15) so we could get a patio seat. The wine was amazing (Dr. Loosen- Riesling from Mosel, Germany) I got the 10oz fillet, medium- cooked perfectly. And my husband and I shared 2 side. I would highly recommend the black truffle mashed potatoes. Very expensive, but well worth it. It is a favorite of our for years. Beautiful old-school decor, service is exceptional as usual and the food has never disappointed us. We travel the world and eat at many fine restaurants but this still ranks very high for my wife and I. It was a birthday treat and the staff were very attentive and friendly. We were seated right away and wished a happy birthday by our server. The food as always was mouth-wateringly good. The signature sauce is simply wonderful. We have learnt over the years not to order staters and only have one side each as then there is less food left over. As it was a birthday celebration we all got a chocolate disc with three Bon bons which was a lovely touch. We will be back as this is the first place we book after sorting flights and hotel. Wish they would open a Prime in London UK. As always an excellent dining experience. The food is phenomenal, and the service impeccable. Kudos to the entire staff for taking such good care of me and making me feel so comfortable and welcome. Excellent in every category. Outstanding dinner. Food and service was very good. We enjoyed the dinning experience!! We had an amazing time at Prime. The view was incredible and the food was outstanding. they really made my husbands birthday special!